‘Locally sourced’ is more than just a buzzword at Tilbury Farm in West Somerset. In fact, there’s so much provided right on the doorstep of this 50-acre farm that you can enjoy the rare privilege of never steeping foot inside your car. The local pub – a warm, low-beamed boozer – is within easy walking distance and there’s a good farm shop and butchers in the village. Morning papers can be delivered to your door (best mulled over beside the remains of last night’s campfire) and, as for things to do? Well, in the heart of the Quantock Hills, unfurling in a patchwork of greenery all around, there are footpaths and bike tracks galore. On the south-facing slopes of Lydeard Hill, Tilbury Farm is home to Jenny, Matt and their three children, who together tend to the farm’s animals – sheep, pigs, ponies and chickens – as well as a couple of self-catering cottages. 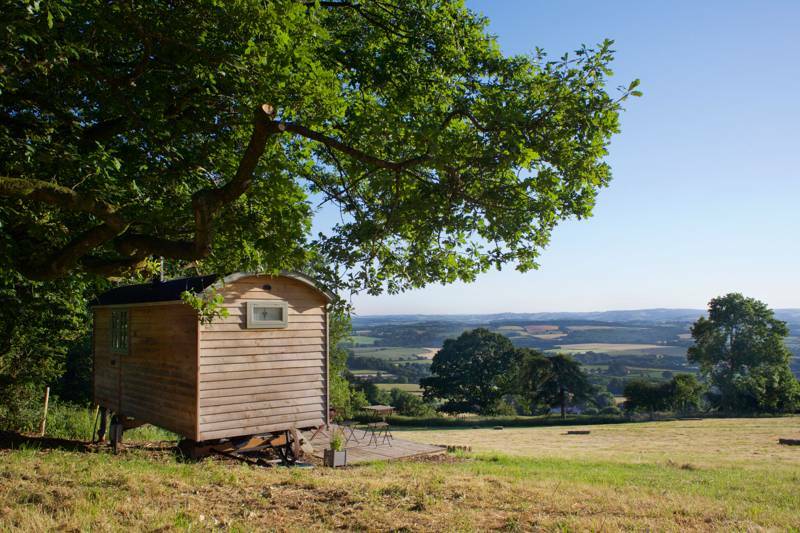 The real pièce de réistance, however, is their newest offering, a trio of beautiful shepherd’s huts with views down the slope and out across Somerset and Devon beyond. 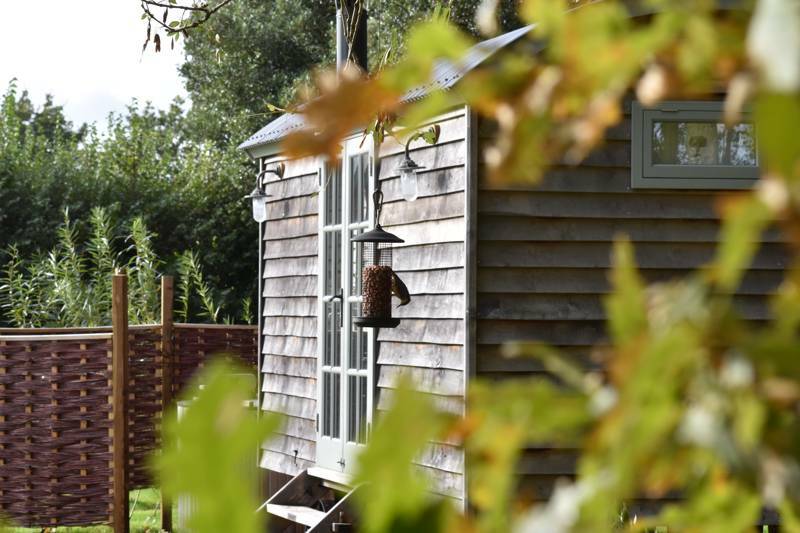 In keeping with the setting, the huts are locally built and feature the likes of Somerset woollen blankets and sheepskin throws, while the attention to detail means everything you need is covered. Inside, the comfortable double bed disappears into the wall by day, revealing a dining area where you can enjoy your complimentary breakfast hamper, while, at the other end, there’s a plush en-suite shower room where even the water is local – straight from the farm’s own bore-hole. There’s a wood-burner for cooler evenings and a compact kitchenette, with a sink, fridge, hobs and plenty of storage. Outside, a wooden deck has chairs and a fire pit for summer evenings enjoying the view. It’s a short stroll to the top of the hill above the farm, where whitethroats, willow warblers and yellowhammers attract the local birdwatchers (there are bird books and guides in the shepherd’s huts). Kestrels frequently hunt over the area too. From here you can follow the spine of the hill and continue up to Wills Neck, the highest point in the Quantocks, and enjoy views north to the Bristol Channel. Just next door to Tilbury Farm there’s a trekking stables that can take you out into the hills on horseback if you prefer (much recommended by Jenny and the kids), while in Bishops Lydeard, three miles away, there is also a station on the rather romantic West Somerset Steam Railway that can puff you out to the coast. So, when you do finally get back into your car, you might just find that driving isn’t all it’s cracked up to be. 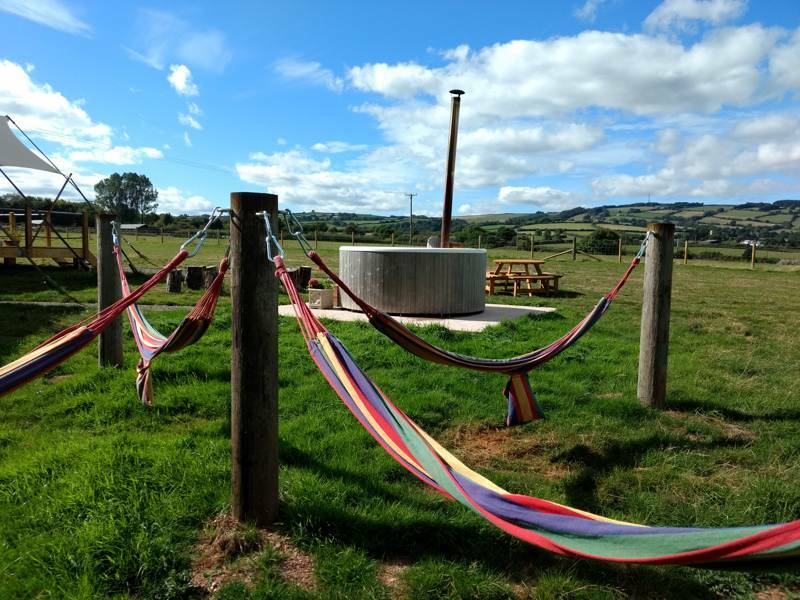 Nestled in a fold of the beautiful Quantock Hills and enjoying breathtaking panoramic views of the surrounding countryside, eighteenth century Tilbury Farm offers a wonderful choice of varied luxury self-catering accommodation. Make your choice from a converted sandstone barn, a cosy shepherd’s hut on your own private hillside meadow from which to enjoy sunset views towards Exmoor or, for larger groups and family holidays, the sixteenth century thatched cottage sleeping eleven may be more suitable. 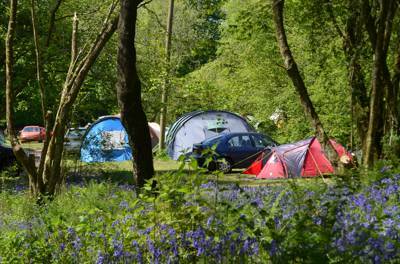 For latest availability and best prices for Tilbury Farm Glamping , please use the Date Search above. 3 luxury shepherd's huts – a pair sleep 2 adults and 1 (young) child, the other has room for 2 adults and up to 3 children. Shepherd's huts have a hidden, fold-down double bed and a separate day bed (1½ metres long) for a child (all bed linen and towels provided). Fully-equipped kitchenette with a butler sink, two-ring hob, fridge, a wood burner (which provides a small oven in which to heat a lasagne, casserole or bake potatoes) and all the pots, pans, crockery, cutlery and utensils you need. Barbecue grill outside and breakfast hamper provided (see Food & Drink). Private, en-suite shower room with basin, shower and a flushing toilet. Electric lighting and plug sockets in the hut. Lots of little extras – cards, board games, dominos, book, maps, record player, records and a radio, wildlife guide books and more – plus free WiFi. Complimentary newspaper (inform the owners of your preference upon booking). Secure storage for bikes and washing facilities. Tilbury Farm has a washing machine and dryer for your clothes. Taunton (a 20-minute drive) has a good museum – The Museum of Somerset (01823 255088) – as well as a theatre (01823 283244), a cinema and a good deal of shops. There's also a farmers market every Thursday on the High Street. Hestercombe House (01823 413923; 15 minutes) houses an art gallery, while medieval Cothay Manor (01823 672283), with 12 acres of gardens, and a tea room, is well worth the 35-minute drive. If you want to just embrace the rain and get wetter, Wimbleball Lake (30 minutes) on Exmoor is great for watersports. For walkers and mountain bikers, Tilbury Farm is a boon. The farm has secure bike storage and a hose-down area and can also help arrange bike hire if you haven't brought your own. Some of the best trails in the Quantock Hills are right on your doorstep, taking you east towards Hawkridge Reservoir or north-west towards Wills Neck, the highest summit in the Quantocks and one of the highest points in Somerset. On a clear day it is possible to see Exmoor, the Mendips and Blackdown Hills and even as far as the Brecon Beacons across the Bristol Channel. It's about a 3 mile walk (6 miles there and back) from the farm. If you don't fancy doing the work yourself, pony trekking is available at the neighbouring trekking stables (07595 446252) or hop on a train: The West Somerset Steam Railway (01643-704996) has a station at Bishops Lydeard (10 minute's drive; 3 miles away), where you can take trips out to the coast at Watchet and Minehead. Kilve Beach is the closest (great for fossil hunting and walking), with a good tea room (Chantry Tea Rooms; 01278 741457) on the waterfront. A complimentary breakfast hamper is provided on your arrival. This includes a loaf of bread, eggs, bacon, sausages, juice, milk, biscuits and butter (let the owners know of any dietary requirements upon booking). It's a 10-minute walk down the lane to The Rising Sun (01823 432575) a homely, "smart with a heart" country inn, with a slate floor in the bar, hefty wooden beams and a warm but light feel. It has a good local buzz in the bar, while a restaurant, on the other side of a wood panel, has it's own chic character, away from the drinkers. Booking recommended on the weekend (children and dogs welcome, cards accepted).There's a farmshop, a butchers, a small Co-operative and a Post Office in Bishops Lydeard, 3 miles away. Shepherd's huts from £95 per night. From Junction 25 of the M5, follow signs to Taunton on the A358. At the first roundabout, take the second exit onto the A358. At the major crossroads by Creech Castle, continue straight on the A358. At the next roundabout, take the third exit onto Obridge Viaduct / A358. At the roundabout, take the first exit onto Priorswood Road / A358. Keep right at the fork and continue onto Kingston Road (signed to Kingston st Mary). Continue straight for 5 miles, passing through the village of Kingston St Mary and then up Buncombe Hill. At the top of Buncombe Hill (by Pines Café), turn left. Continue along this road for 1¼ miles. Take the first right at Park End lodge following signs to West Bagborough. Take the first left (after ¾ mile) an head down the hill towards West Bagborough. Tilbury Farm is l½ mile down this hill on the right hand side. The nearest train mainline station is in Taunton, 7 miles away (from there it is a 20 minute drive) and the nearest bus stop is in Bishops Lydeard, 3 miles away. The owners of Tilbury Farm are able to help arrange a taxi if required.